Cell division is an important process in development, tissue repair and reproduction in a wide variety of animals. The purpose of cell division is to separate the genetic material, or DNA, into two newly forming daughter cells. Failures in cell division often lead to human diseases including cancer or Down Syndrome. More recently, loss of genes involved in cell division have been shown to lead to neurodegenerative diseases, such as Alzheimer’s, yet the reasons why are unclear. Understanding how cell division genes function and how they are regulated is important in our search for answers. Fig. 1. Normal embryos contain discreet midzone microtubules while loss of ATX-2 leads to faint or barely visible midzone microtubules, suggesting that ATX-2 functions to properly maintain this structure. (Adapted from Gnazzo et al, 2016). In an article published in Molecular Biology of the Cell, August 2016, using genetics and microscopic techniques, our lab demonstrated that depletion of a homolog of a human neurodegenerative disease protein, ATX-2 in nematode embryos, results in cell division failures and loss of spindle midzone microtubules, structures necessary for daughter cell separation (Fig. 1). We discovered that the ATX-2 protein targets and maintains a kinesin motor protein, called ZEN-4, to the spindle midzone. Without ZEN-4 at the spindle midzone, cell division fails. ATX-2 mediates this by regulating another conserved protein, called PAR-5, a regulator of protein translation. PAR-5 normally binds to and prevents ZEN-4 from getting to the spindle midzone. We discovered that ATX-2 regulates the expression and localization of PAR-5 to spindle structures necessary for cell division (Fig. 2), thus allowing for proper cell division to proceed. Lastly, we have shown that both ATX-2 and PAR-5 localize to mitotic spindle structures, which had not been described previously. Since both ATX-2 and PAR-5 are protein translation regulators, the localization patterns and shared regulation in cell division suggests a broad and important role for localized RNAs during cell division. Fig. 2. 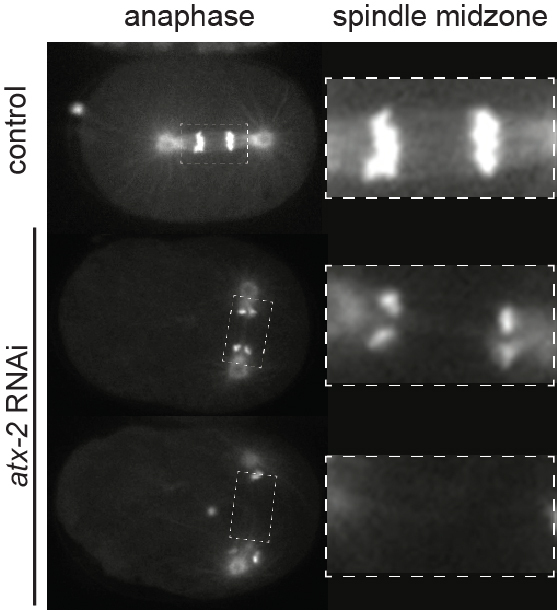 ATX-2 regulates the proper localization of ZEN-4 (purple) and PAR-5 (orange) to the mitotic structures needed for the successful completion of cell division. (Adapted from Gnazzo et al, 2016). The mitotic function and dynamics of RNA is a very new and exciting research area that has far reaching impacts on our understanding of neurodegenerative disease. The RNA-binding protein ATX-2 regulates cytokinesis through PAR-5 and ZEN-4.